After working for 20 years in fashion and textiles, Heather’s new artistic direction is due to her passion for painting and all things creative. Tell us about your beginnings as an artist. What and who inspired you? I used to sit for a summer portrait painting class years ago when I was a student. The tutor told me I should come along to one of her painting classes and have a go. I had no money at the time, being a penniless student, but she let me go to one class for free. I’d never done it before. I think she thought, being a creative person, I would enjoy it. She was right. I completely fell in love with painting from that day. I just went to the one class as I didn’t have money to pay for the course and didn’t pick up a paint brush again for years, but I knew instinctively, from that point, that painting would feature very strongly in my future. I knew that at some point I would become a painter. You have done a lot of life drawing over the years. Do you still do that? Is it one of the courses you run? I have done a lot of life drawing and I absolutely love it. I think life drawing is very important if you are doing any kind of artistic practice as it involves you having to be very observant, thinking of proportions, scale, tone, line, so many many things. I find it very relaxing and I love the curves of the human body. I don’t teach it because there are many life drawing classes already in my area, but it may well be something I do in the future. You were a designer in the fashion and textile industry for over 20 years, what decided you to become a full time artist and tutor? I am still a part-time artist really as I run a small business selling vintage clothing and jewellery. I can’t wait to make the cross-over into being a full-time artist but I’m not sure when that will be yet. Hopefully very soon! Being an artist is my final destination though. It’s something I’ve wanted for a very long time, as I mentioned above. I paint portraits mainly. I adore looking at faces and studying the shapes, shadows and colours in skin. I find faces particularly fascinating. Having said that, I find bodies fascinating too! Perhaps it’s not that removed from working in fashion when you consider that fashion is all about wrapping and adding coloured layers to the body, in the form of cloth. I’m going from wrapping the body in clothing to removing the clothing and painting what’s underneath instead. Tell us about courses you teach. They seem to be a very varied mixture, would you agree? The courses I run all link to my years spent in fashion and textile design. There always seem to be lots of courses for painting and art related subjects, but no so much in the way of textiles. Not in my home town area anyway. I have a lovely group of ladies who come to me on a Wednesday afternoon for silk painting sessions, and I will be continuing this course in the new year. It’s very relaxed, students pay per session and the sessions will just roll on, so you can sign up to as many or as few as you want without losing any money. I find that a lot of people don’t want to commit to a set number of weeks, so this way of working suits them much better. I also have a group of teen fashion design students (aged 12 and 13) who are currently doing a research and fashion design project which they are absolutely loving. They’re chomping at the bit to do it again in the new year and this kind of course is something I really want to build on. Not just for teens, but for adults too. This course is currently running for 6 weeks. However I will look at extending it to 10 weeks to give students more time for research and designing. My other course starting in 2015 will be creative applique. It’s such good fun, very creative and very rewarding. Taking your scraps of fabric and turning them into a fun picture or a design for a cushion or shoe bag, that type of thing, is great. So easy to do once you know how! 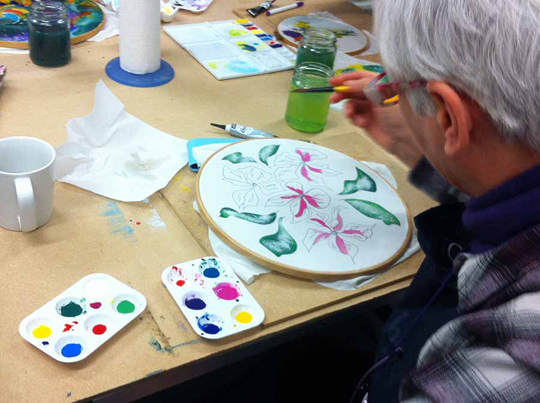 This course will also run on a rolling week by week basis, the same as the silk painting one does, so people can come along on weeks that fit in with their schedule. Tell us about your approach to a student or class; do you have any particular teaching method? I encourage my students to experiment and not worry too much about the final outcome at the very beginning. All mistakes lead to you learning something new as well as a better understanding of how to approach your task. I’d say I’m more hands on than a talker. I like to give people my personal attention whenever I can. I am very enthusiastic about people learning at their own pace and I like the classes to be as relaxed as possible. I find students are quite often hard on themselves, expecting to pick up everything and be amazing from the word go. I do try to make them see that learning something new is an ongoing process. You really can’t know it all straight away. If you did, I’d be out of a job!